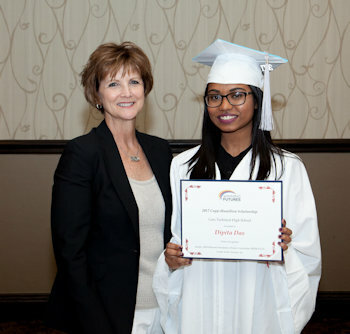 Dipita Das (right) with her mentor, Sharon vanSpronsen (left), at the 2017 Awards Ceremony where Dipita received a Winning Futures scholarship. We are very proud to announce that our mentoring program was recently awarded the National Quality Member designation from MENTOR: The National Mentoring Partnership (MENTOR). We are the first and only mentoring program in Michigan to achieve this distinguished honor. To earn the National Quality Member designation, we participated in a comprehensive self-assessment that was facilitated and supervised by representatives from Mentor Michigan, an affiliate of MENTOR. From program design and financial operations to data collection and outcomes, all aspects of the program were analyzed and deemed safe, effective, and aligned with national mentoring best practices. For students like Dipita Das who graduated from our mentoring program, the National Quality Member designation comes as no surprise. Dipita was just a kid when she immigrated to the United States. Growing up in a country where you barely speak the language and know nobody can be difficult, especially for a teenager who is struggling to see a future. This was Dipita. She was upset, alone, and completely overwhelmed. Through our mentoring program, Dipita received the support and guidance she needed to see a path to a purposeful career and create a road map to get there. Today, she is a student at the University of Michigan where she plans to study immigration law. Learn more about our award-winning program and how you can get involved!